Executive Pastry Chef Kurtis Baguley will compete in Winston-Salem, N.C., on Monday for the title of American Culinary Federation (ACF) Southeast Region Pastry Chef of the Year. The winner will advance to the national competition here in Orlando, July 14–17. The ACF Pastry Chef of the Year award recognizes a pastry chef who displays a passion for the craft, has an accomplished reputation in the pastry field and has helped educate others by sharing skills and knowledge. Certainly, anybody who has sampled the amazing pastries that come out of Chef Kurtis’ kitchen can vouch for his excellence in the field. At this regional competition, Chef Kurtis will prepare four portions of a hot/warm dessert featuring pineapple. He will have 15 minutes to set up, 60 minutes to cook, 10 minutes to plate the dessert and 15 minutes to clean up. Judges will evaluate cooking skills, taste and professionalism. The winner will be announced at the Regional Awards Gala, Wednesday, Feb. 22. 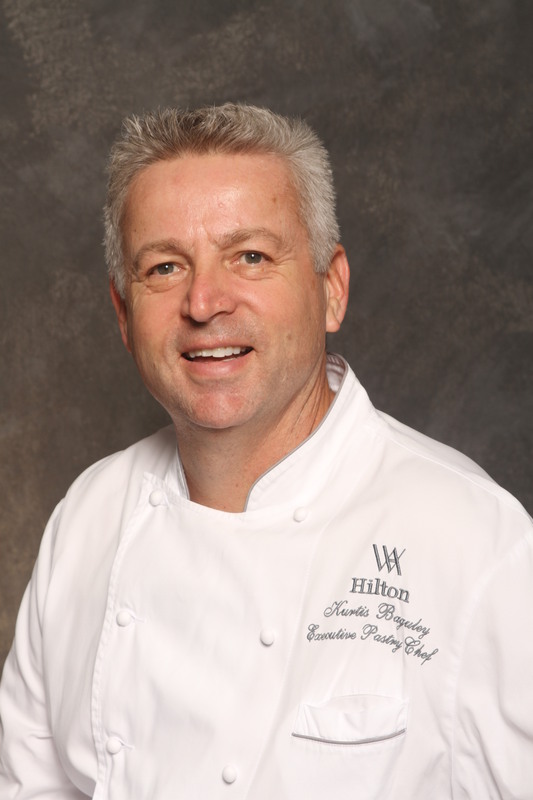 Chef Kurtis Baguley is executive pastry chef at Waldorf Astoria Orlando and Hilton Orlando Bonnet Creek Resort. He facilitated the startup of the hotels’ pastry kitchens, developed crews, and created menus for the properties’ openings. Baguley oversees a staff of 14 employees and eight food outlets. Born and raised in South Carolina, he earned an associate degree in European cuisine from California Culinary Academy, San Francisco. For 25 years he worked at some of the top hotel pastry kitchens in San Francisco, including Silks at the Mandarin Oriental Hotel; Redwood Room at the Clift Hotel; and Scala’s Bistro at Sir Francis Drake Hotel. Baguley then moved to New York to work for a restaurant group producing desserts for five restaurants and running the group’s full-scale artisan bread company. After working in Napa, Calif., and Salt Lake City, Baguley moved to Florida. He is a member of ACF Central Florida Chapter.